A 30 -year-old Comedian with Uganda Comedy Store Charles Kasozi aka Mariachi together with his bodyguard Michael Bunjo have been arrested by police for allegedly assaulting a traffic officer tearing his uniform. According to Police, Kasozi and his accomplice committed the offence on 30th June 2018 at 8p.m. at Mengo. Police further states that, the suspect assaulted PC. Eldard Kamugisha a police officer attached to Old Kampala Police Station Traffic Department by hitting him with elbow on the face while performing his lawful duties. It is alleged that the comedian was driving a vehicle registration number UAZ 127T on a one way road. The police officer then was stopped him for questioning and there after cautioned regarding the offence he had committed. The mele caused alot jam police statement added, the unapologetic driver refused to heed to the traffic officers directives of reversing and using the right lane. 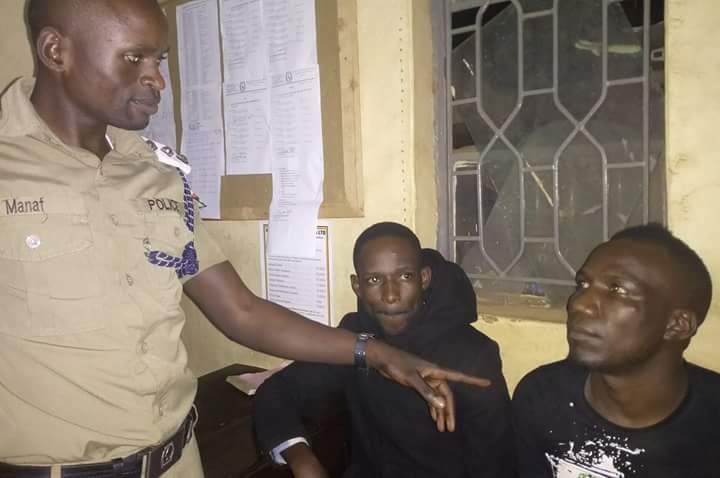 Upon insisting on using one way, the officer requested to have a look at the vehicle particulars and driving permit however Kasozi instead came out of his vehicle, verbally insulted, assaulted and willfully tore the uniform of the officer. The officer has been rushed to Mulago Referral Hospital for medical attention. Charles Kasozi is currently detained at Old Kampala Police Station vide SD reference 63/30/06/2018 and is to be charged with four counts of careless driving,obstructing an officer on lawful duty, causing damage to government stores and assault. This comes as the third deliberate attack on traffic officers this year. Two days ago Cpl. Nnalongo Alice Nakandi who has been guiding traffic for over a decade now was knocked down by a careless rider as she directed traffic flow around Bugolobi Junction. The late Cpl Wilfred Tweituk, a traffic officer attached to old Kampala police station was knocked dead by a bus owned by Devine Bus Company while on duty along Kabakanjagala-Nabunya junction along Rubaga road.